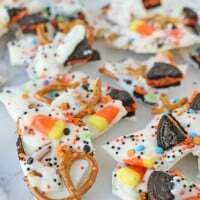 I’ve been on a bit of of Rice Krispies Treat kick (most recently with these Oreo Rice Krispies Treats) and wanted to make another fun, kid friendly option. 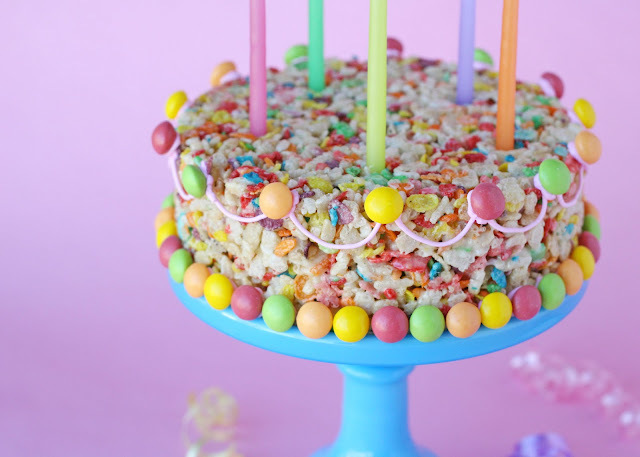 I’ve made Krispy treats with Coco Pebbles before (pre-blog), but wanted to try fun and colorful Fruity Pebbles! I thought the rainbow colors looked so celebratory already, that they would be perfect for a cake. 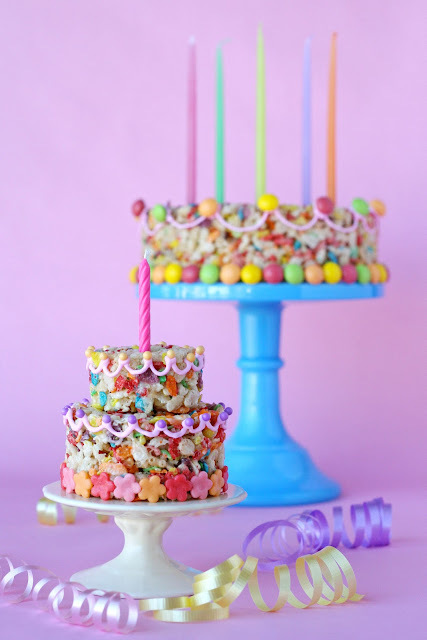 This would be a fun cake for a birthday, and especially perfect for those who are on Gluten-free diets (please check the cereal packaging for ingredients). I was recently sent some candy from Wrigley, including lots of Skittles, and knew they would be an easy and colorful decoration. This would be a sweet option for a birthday boy or girl to get their own little “cake”. Prepare your dish (either a 9″ x 13″ casserole dish, or a cake pan of your choice) with non-stick cooking spray. To make the cakes shown I used a 6″ cake pan (3″ tall) and also used two measuring cups to make the mini cakes (I used a 3/4 cup and 1/3 cup). In a large, microwave safe bowl put the marshmallows and butter. Microwave about 3 minutes, or until marshmallows are large and puffy (make sure your bowl is large enough, the marshmallows will at least double in volume while heating). Meanwhile, pour the cereals into a large bowl and gently mix. 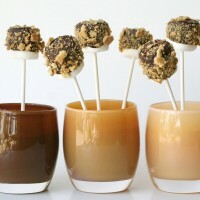 When the marshmallows are melted, stir with a spatula that has been sprayed with non-stick cooking spray. As soon as the marshmallows and butter are smooth and incorporated, pour over cereal, and mix quickly. Once the cereal and melted marshmallows are mixed, pour/scoop the mixture into your prepared dish. Press into dish or cake pans, smoothing the top with the oiled spatula. Allow to cool about 20 minutes. Cut and enjoy! *To decorate as cakes- I used royal icing to attach the candies and added the little swag, (candy melts or frosting would work as well). For the mini cake I warmed a few Starburst candies, rolled them out and cut them with a mini flower cutter. I also decorated the mini cake with some candy pearls. Aww this is so pretty! Love this idea! This makes me want to skip like an 8 year old!! I looooooove it! Super cute! I love how bright and cheerful it is! Love you! This is DELIGHTFUL! I hope it's okay with you that I pinned it, it's too wonderful not to sharee! Does anyone know of a fruity pebbles equivalent in Australia? Great idea, fast and very colorful! I love it! I thought the *big* cake was neat..but I LOVE the little two-tier cake!! My granddaughter already had her birthday last month, so i'll just have to find someone else to make it for. LOVE it! Lovely idea!! I do have a question though: does this cut ok?? I can see it may be a little hard to get a beautiful piece out of it! That is adorable! I have lots of friends with kids on a gluten free diet that I must share this with! Adorable! I would want the whole cake to myself though… and I mean the larger one. Rolled Starbursts cut with a flower cutter?! Brilliant! 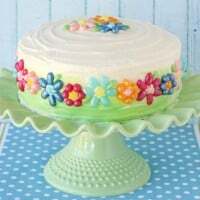 This is such a Beautiful cake, I love it so much…. My girls would love this for their birthdays! Thanks for sharing!!!!!! I came across your blog this morning from a pin about your cupcake frosting techniques…I just finished reading through it. Your entire blog, that is. I cannot wait to (attempt) to make some beautiful Easter cookies. This blog is truly an inspiration. So adorable… love your Fruity Pebble Cakes! 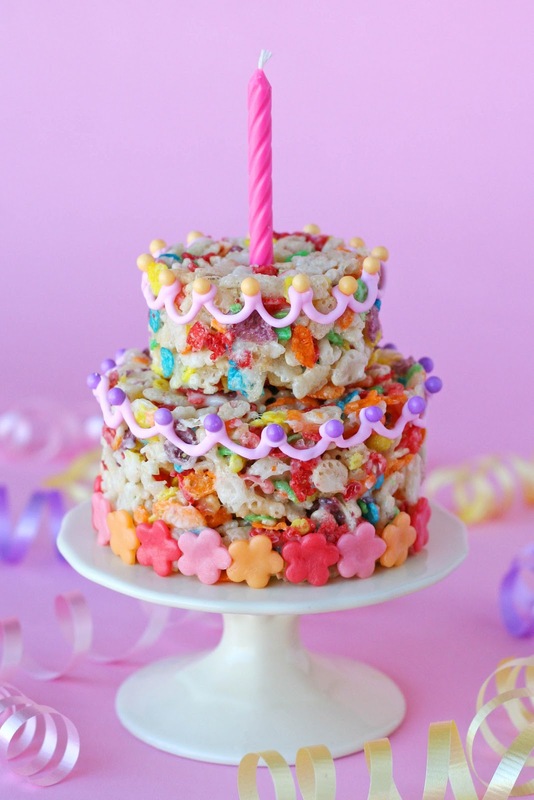 Kids would go crazy for such a colorful and sweet cake! 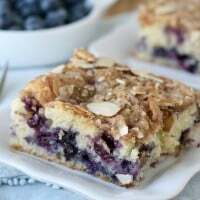 I may be clueless when it comes to cake, but I bet I could make this and I know I'd love it! Stunning creation and beautiful photos. Thanks for sharing! 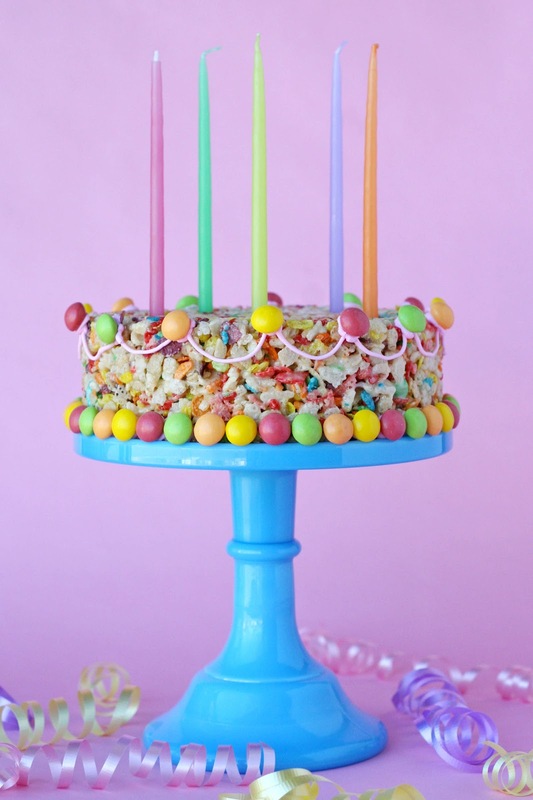 What a cute and colourful blog full of ideas! I am your latest follower!!! EEEEE! Cute overload! I adore these little sweetie cakes! It's not just that you used one of my very favorite cereals, but they are Seriously Cute. Seriously! I'm in love. I am going to use this for my birthday this July. I'll be turning 35, haha! Love your cute, cute, cute ideas!! We use this option a lot for my son that has celiac. But Fruity Pebbles ARE NOT gluten-free, but Malt O' Meal Fruity Dino Bites are. When you are checking for gluten you also have to check for malt. This is WONDERFUL!!!! Great job!!!!! Yes, feel free to melt the butter and marshmallows on the stove. It takes a bit longer, and you have to be sure to stir so it doesn’t burn, but I’ve done it several times this way too. Happy treat making!